This is a substantial revision of a much-quoted monograph, first published in 1974. The structure is unchanged, but the text has been clarified and the notation brought into line with current practice. A large number of 'Additional Results' are included at the end of each chapter, thereby covering most of the major advances in the last twenty years. Professor Biggs' basic aim remains to express properties of graphs in algebraic terms, then to deduce theorems about them. In the first part, he tackles the applications of linear algebra and matrix theory to the study of graphs; algebraic constructions such as adjacency matrix and the incidence matrix and their applications are discussed in depth. There follows an extensive account of the theory of chromatic polynomials, a subject which has strong links with the 'interaction models' studied in theoretical physics, and the theory of knots. The last part deals with symmetry and regularity properties. Here there are important connections with other branches of algebraic combinatorics and group theory. This new and enlarged edition this will be essential reading for a wide range of mathematicians, computer scientists and theoretical physicists. 1. 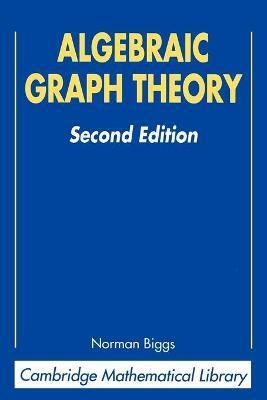 Introduction to algebraic graph theory; Part I. Linear Algebra in Graphic Thoery: 2. The spectrum of a graph; 3. Regular graphs and line graphs; 4. Cycles and cuts; 5. Spanning trees and associated structures; 6. The tree-number; 7. Determinant expansions; 8. Vertex-partitions and the spectrum; Part II. Colouring Problems: 9. The chromatic polynomial; 10. Subgraph expansions; 11. The multiplicative expansion; 12. The induced subgraph expansion; 13. The Tutte polynomial; 14. Chromatic polynomials and spanning trees; Part III. Symmetry and Regularity: 15. Automorphisms of graphs; 16. Vertex-transitive graphs; 17. Symmetric graphs; 18. Symmetric graphs of degree three; 19. The covering graph construction; 20. Distance-transitive graphs; 21. Feasibility of intersection arrays; 22. Imprimitivity; 23. Minimal regular graphs with given girth; References; Index.